Does the United Church have a theology? Critics often ask this question with incredulity when complaining the denomination is so open it stands for nothing at all. “The church that is afraid to be church,” a friend of mine once called it, “because it doesn’t want to offend anyone.” Especially with the public controversies the United Church has weathered over the years — notably former moderator Very Rev. Bill Phipps’s questioning of the resurrection and Rev. Gretta Vosper’s avowed atheism — it can be difficult to get a clear picture of the United Church’s theological bedrock, if such a thing exists at all. The Theology of The United Church of Canada, a new book edited by Rev. Don Schweitzer, Rev. Robert C. Fennell and Michael Bourgeois, sets out to clear up the confusion. The editors are all professors at different Canadian theological schools, and most of the book’s contributors also reflect an academic orientation in addition to being ordained United Church clergy. Each chapter addresses a different core element of systematic theology and church practice, such as worship, the nature of God and the doctrine of sin. Chapter by chapter, the book explores how each of these themes has been expressed in the United Church’s four official faith statements: the original Twenty Articles in the Basis of Union; the Statement of Faith from 1940; A New Creed (1968) and its revisions; and, most recently, the Song of Faith (2006). While this historical orientation makes the book a welcome contribution to church scholarship, it may leave church members struggling to connect it with the big questions of their lives and their reasons for continuing to show up in church on Sunday. 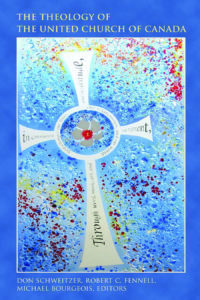 The Theology of The United Church of Canada, published by Wilfrid Laurier University Press. The chapter I found most engaging was Rev. Harold Wells’s discussion of the theology of Creation. Starting with an overview of its earliest roots in the Bible, Wells traces the changing vision of nature expressed by the United Church. This begins with the classical theism of the Basis of Union where “God is above all things and in them all,” and nature is named as one form of God’s revelation. In A New Creed, a more evolutionary tone is adopted: God “has created and is creating,” it says. And in the Song of Faith, a more emphatic ecological awareness appears, reflecting increasing social concern about climate change. In the Song, God’s presence is explicitly situated in “the complex patterns of growth and evolution,” and human sin is directly connected with the “delusion of unchecked progress and limitless growth that threatens our home, the earth.” Wells pointedly connects the Song to the imperative of social action, calling us to question our own habits of consumption and to act in more environmentally sustainable ways. The other chapters lack this sense of critical engagement with issues of pressing concern, and feel less immediately applicable as a result. The chapter on sin and redemption, for example, is fascinating in its historical detail but doesn’t provide resources for responding to the multiple forms of brokenness and human cruelty that are rampant today. Each writer in the volume is painstaking in tracing how and why United Church doctrine has changed over the years, but I found myself questioning as I read the book whether a church’s theology lies in its doctrinal statements or in its people. I suspect few of the faithful sitting in the pews — and perhaps even standing in the pulpit — often draw on these statements as a testament to their faith or as a living expression of their understanding of God, of Jesus or of the ethical commitments that animate their spiritual lives. Perhaps they should do so more often. But whether or not this book will trigger people’s curiosity to turn to the United Church’s statements of faith and study them more closely remains to be seen. It’s one thing to have a doctrine. But the greatest value of doctrine is its ability to help church members feel more grounded in the roots of their tradition and affirmed in their faith. Nonetheless, The Theology of The United Church of Canada does correct the view that the United Church is a theology-free zone. It leaves no doubt that our denomination has been actively debating matters of theological substance since its founding, inspired by the works of theologians as diverse as Karl Barth and Paul Tillich, and informed by changing social attitudes toward sexuality, the environment, Indigenous spirituality and racial diversity. In this respect, it is a welcome addition to the literature. The book does not reveal a church that is afraid to be church, but one that is courageous enough to embrace change and acknowledge human mutability in the face of an enduring God. It shows that there is a strong theological bedrock in our tradition, for anyone interested enough to look for it. But church members concerned about how to proceed in the wake of the Vosper controversy or wondering where the United Church is headed in the future may not find answers to their questions in these pages. It’s one thing to have a doctrine. But the greatest value of doctrine is its ability to help church members feel more grounded in the roots of their tradition and affirmed in their faith. People need to be invited into conversation with it, to use it not as a blueprint but as an opportunity for thinking theologically about the things that matter to them. Although the historical orientation of this book may not immediately satisfy people’s yearning for theological reflection and conversation, it would be an excellent basis for a study guide to meet this important need. Jane Dawson is the minister supporting communities of faith, clusters and networks for Region 12 (Eastern Ontario Outaouais). "No magic formulas. Just grace emerging through weakness."